What a sweet moment! I hope it did brighten his day. Rainbows for me? Returning from vacation to find my team missed me. They gave me many rainbows over the past two days. I had a required meeting after work last night from 5:30-9:00. grumble-grumble. They did serve a light dinner, though, and...generous pieces of chocolate layer cake. Cake makes everything better. I like the idea of a rainbow moment. I'll have to try and remember that. Brooksba: I'm sure he at least got a smile out of it! I know your team must have missed you. You sound like a neat person to work with and one with great leadership skills. Diana: Yeah, the cake would be the rainbow for me too! Richard: Thanks, it is neat and I once called it, "Highlight of the Day" but I liked it better as rainbow, especially for the younger children. It would be cool to do with your kids before you tuck them in since it's reflective and calls some higher level thinking skills into use. It also makes kids feel they have "air time" and are listened to by adults. I'd always share mine too with them just to model it and let them learn a bit about me as a real "person", not just their teacher. It's a small thing, but i went swimming this morning. And as i got out of the pool at the end of my workout, the much younger man in the next lane eyed my legs. Meno: At my age, I'd count that as a serious and very colourful rainbow! May even be a pot of gold at the end of that one! Little moments like this often have the largest impact on everyone involved. My rainbow? Waking up in the morning and seeing our youngest son - 6 - waddling into our room for a good morning hug. He often comes in before he's fully awake, and those squishes are just precious. I could hold him all day. Annelisa: Ha! Ha! Very clever! And thanks. Carmi: Thanks for commenting. Yes, that's got to be an amazing rainbow feeling! Enjoy him! Mother, first off, I thought you weren't teaching school this year...are you now back? I do like your rainbow moment. 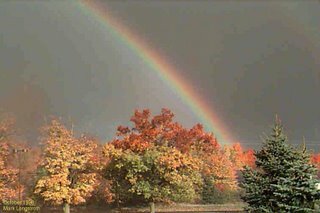 When I lived in Florida, I could see rainbows that went from horizon to horizon and whenever I saw one (frequently because of the vast sky and the sun shining while it rained) I considered myself blessed. lucky, or whatever you want to call the happy feeling you mentioned. Beth: Well, then I'm sending you a colourful rainbow vibe! One will come to you soon. This brings to mind the Irish legend of the pot of gold at the end of the rainbow. The best things in life are free! Aren't they? 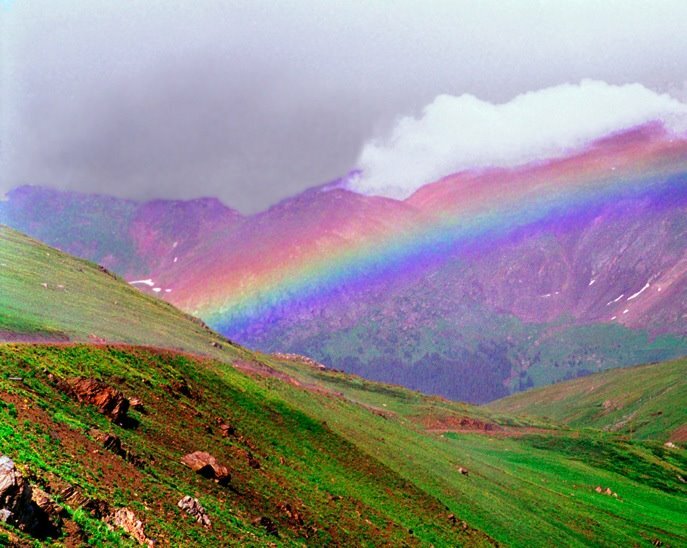 I'll be on the lookout for my rainbow moment today. Colleen: Yes, on St. Patrick's Day the kids at school all want to draw and colour rainbows and that pot of gold! I'm sure you get lots of rainbows in your days! My rainbow was a friend from my childhood and I finally were able to reconnect and are now emailing each other. How lovely to be remembered through years apart. My rainbow was a warm welcome back to my office after being away for almost 3 weeks. Even though I told them I would really rather be in France, they ate the chocolate I brought back and said "welcome home." I do love the people I work with. My ex-wife quoted my daughter as having told her "Dadddy's alright- all you have to do is point him in the right direction." That's a rainbow. "Mother of Invention, just refracting a little light in the world!" Maggie: That is a fabulous rainbow! I love when that happens,especially when you feel you can pick up where you left off and everything's comfortable. I was going to connect with a friend I haven't seen for about 10 years tomorrow but had to cancel due to a cold I have. Rats! Barbara: That is a great feeling indeed and you were away a long time. I bet they were glad to see that chocolate too! HA! Steve: That IS a gemmed sparkly rainbow! (And kudos to your ex for sharing that with you.) Thanks for the compliment and the refraction! A fine collection of rainbow pictures there. 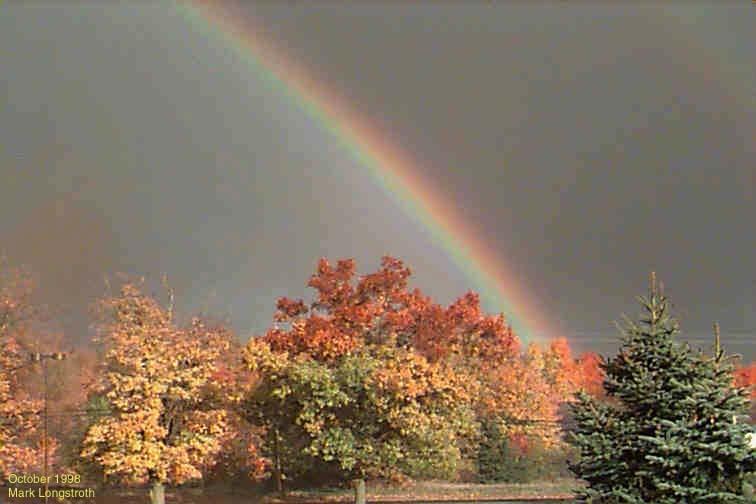 can't think of any recent rainbows, but I would like to see another rainbow--a real one--it's been years. My rainbow for the day is a visit from my brother who lives in Vienna. It's been almost a year since we've seen him. Carli: Hope you see one soon! SRP: That's a beauty! Enjoy! arroz caldo is a Spanish dish kindof like a rice porridge with bits of chicken and some ginger, onions, garlic. Love the rainbow idea. I will incorporate it in my second grade classes and let you know what rainbows we collect. Thanks! Charles:Thanks for the visit and for enlightenig me on your Spanish dish...sounds delicious! You knew Baba Yaga? Neat! Catherine: You were commenting at the exact time I was on yours! Those flowers are beauties! Pauline: Thanks! Once they get to know what is expected, they usually pull through with some good ones! A rainbow of my day - what a lovely idea! I guess for me, would be simply a sweet smile from my younger son and a big hug from my elder son when I come home from work. Thanks for your sharing which lighten up my day. Fennymun: Thanks. You have 2 great rainbows every day! There was a quote I saw in the For Your Success blog about having to sometimes make your own rainbows. I think that's very insightful. Kilroy: OOPs! I posted my response on Odds and Sods post! Sure! More details there. Wow! !Both the pictures are amazing.but i like second picture..it looks fabulous.This is a great moment and reviews given through the article.Thank you.